Utah Division of Wildlife Resources | What’s with the wipers? These fish have become a valuable management tool in Utah waterbodies. WIPERS ARE A sterile cross between striped bass and white bass and were first introduced to Utah in the early 1990s. The current state record is more than 11 pounds and was caught in New Castle Reservoir in 2015. 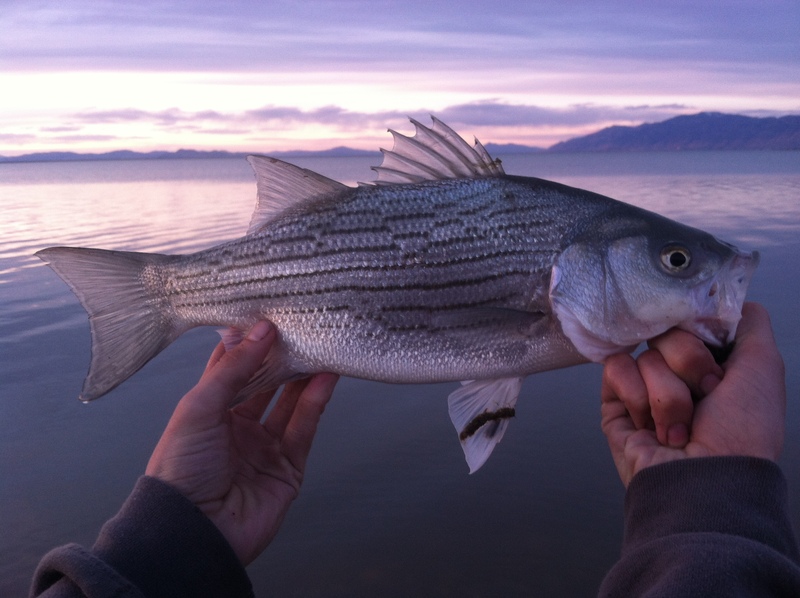 Besides being fun to catch and great to eat, wipers have become an important management tool for the Utah Division of Wildlife Resources (UDWR) in many waters throughout Utah. 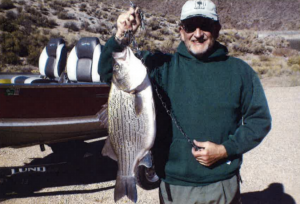 Tom Bellomo set the new Utah wiper record on Oct. 31, 2015. This 11-pound 14-ounce lunker came out of Newcastle. 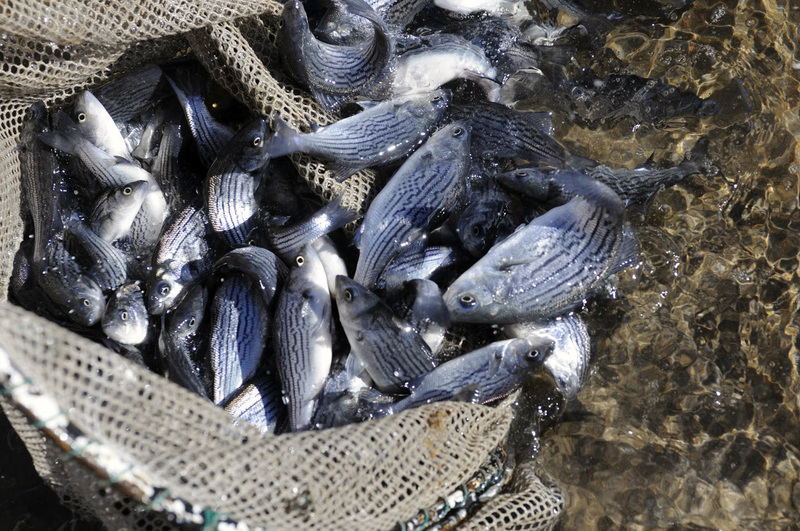 In southern Utah, illegally stocked golden shiners were overrunning Newcastle Reservoir. The shiners had a devastating effect on rainbow trout, smallmouth bass and even crayfish populations by outcompeting them for limited food resources. Stocked rainbow trout had very poor survival and limited growth potential, smallmouth bass reproduction and recruitment was non-existent as young-of-year fish could not compete for food resources. The UDWR had very few options to address the situation. We needed to eliminate — or drastically reduce — the number of golden shiners in the lake. Historically, rotenone (a natural substance that comes from the roots of a tropical plant in the bean family, poisonous to fish) was used to remove all fish and start fresh, however, this option was becoming more expensive and difficult to use, and it’s not always completely effective. Wipers allow us to control rough fish species in lakes that would otherwise need to be chemically treated. This is when wipers came into play. Wipers were introduced to Newcastle Reservoir in 2005, and by 2009 golden shiners had almost completely disappeared. Rainbow trout and smallmouth bass immediately started showing improvements and now they provide outstanding fishing opportunities. With the success of wipers at Newcastle Reservoir — and their popularity among many anglers in southern Utah — they were added to the fish assemblages at Otter Creek and Minersville reservoirs. Both of these reservoirs have undergone periodic rotenone treatments to deal with large populations of Utah chub. Four years after planting wipers in Minersville, Utah chubs had almost disappeared, negating the need for another rotenone treatment. Wipers are sterile, allowing us to easily control their numbers in lakes. Wipers provide the UDWR the option of utilizing a sterile fish to control rough fish species in lakes that would otherwise need to be chemically treated. Chemical treatments are expensive and remove all fish from a waterbody, decreasing fishing opportunities for multiple years in some cases. Planting wipers also provides anglers with diverse fishing opportunities with minimal effects to rainbow trout and smallmouth bass populations. Because wipers are sterile, we can control numbers in a lake by increasing or decreasing stocking rates depending on food availability and negative impacts on other species. Look for more opportunities to catch one of these great “tools” near you!